This book begins with James Herriot, the country veterinarian, beginning his life in England’s military. He desperately wants to go home to his wife and their home. He remembers an old cow named Blossom, who was due to be sold since she was old, but she kept eluding the fatstock driver. She was quite creative in her means of escaping her inevitable fate. Her owner eventually lets her stay at his farm. In Chapter 2, Herriot remembers heading for a Lord’s manor to test his cattle for TB. The Lord liked to make a show of helping Herriot, even though, truth be told, he was actually not very much help. Later, James receives a call from the Lord about a sick pig. Herriot has tried to save pigs with this ailment, a prolapsed uterus before, and both times he has failed. This time, happily he succeeds. Chapter 3 has James remembering his terror of dentists, and the military dentist now has to work on him. He is even more scared when he learns that the military dentist is called “The Butcher”. When he is finally done with Herriot, after a lot of pain, Herriot is reminded of the many wolf teeth he has pulled from horses, and so he tells the military dentist that he pulls teeth the same way – on animals. In Chapter 4, Herriot hears various types of gas and other emanations from his fellow military men. It leads him to remember the gas problem that a bulldog had in their home town. The dog’s owner was petite and feminine, and couldn’t have a dog “behaving” that way. Herriot eventually paired the dog up with a man who had lost his sense of smell, and all was well. In Chapter 5, Herriot notices a policeman chasing a young street urchin, which reminds him of a boy back home. Many pranks are blamed on Wesley Binks, that young boy. One day, Wesley adopts a dog who has distemper, and takes on an actual job to pay Herriot for treatment. Sadly, the dog dies, bringing Wesley to tears. Then he goes right back to his life of mischief. James remembers Skeldale House in Chapter 6 with humor, and a time when Tristan was filling in for the housekeeper. They don’t know that there is only one dish he can cook. At the same time, James and his boss-turned-partner, Siegfried, were confused over a rash of deaths at a local cattle farm. As it turned out, the cattle were eating bits of antlers that had fallen into their feed. As Tristan prepares yet another meal of the same thing, Siegfried says he can empathize with the cattle, and heads out to eat. Chapter 7 finds Herriot reflecting on how little attention veterinarians are given, even when they are called to a farm. He especially recalls an incident where a family’s collie had swallowed a ball, and he was able to dislodge it from outside the throat, since he couldn’t reach it from the dog’s mouth. The family wrote a thank you note that began with a greeting to the vet with a bandage on his finger. Winters in Darrowby are on James’ mind, in the military. He especially remembers his first winter there, when one of his clients is dressed like he is ill-prepared for the weather, even though James is bundled up. But the client is comfortable and James is not. The farmer’s skillful, calm manner is one of James’ first indications of how much he has to learn as a veterinarian. James remembers another Christmas back home in Darrowby in Chapter 9. One particular client is the type he enjoys, since she lovingly cares for her animals and calls even with smaller concerns. A stray cat brings a kitten to live at the client’s house, and then the cat herself dies of cancer. The following Christmas, James visits her house again, and sees the little kitten, now a cat, playing with the client’s Basset Hounds. Times are especially hard for Herriot right now, since his wife is almost ready to deliver their baby, back home. He experiences queasiness, like her morning sickness, and pseudo-contractions. James goes AWOL and home to see his wife, then returns to duty. He is not one to break many rules, but he feels that Helen’s pregnancy was worth the visit. Herriot is at the lowest rank in the military. It’s a feeling he is used to, since for a long time in his practice, he would reach a farm for a vet call, only to find the owner upset that Siegfried hadn’t been the veterinarian to respond to the call. But one of the horses of such a client is choking while Herriot is there, and he realizes it’s an allergic reaction, and cures the horse with one shot. After that, the farmer respects him more. Herriot is guarding a hotel in this chapter, which he finds as humorous, since the hotel doesn’t seem to need guarding. It reminds him of a battle he had with a local man’s sheep dog, Shep. Shep leaps onto unsuspecting visitors from a hiding place in the garden, and he does so to Herriot, when the veterinarian is deep in thought. He is worried about a cow he is treating, who ends up being cured by an idea the postman has, of all people. James takes his frustration out on Shep, not allowing him to scare him, but later sees that Shep is still himself, scaring a local tinker. James goes AWOL once again in this chapter, as Helen prepares to give birth to their baby. He gets home in time to see his new son. He is unaccustomed to the look of newborn humans, and the others are amused at his reaction. He is more used to seeing animal babies. James fakes a telegram and gets more time off, to spend with Helen and their son. James remembers some of the harder parts of being a country veterinarian in this chapter. He recalls a time in a pub after a hard farm call, and how he saw another customer’s dog, who needed surgery. The patrons pitched in money and he performed the surgery on the dog, but the owner just treated the fact as though the dog’s illness had cleared up by itself. In this chapter, Herriot finds out just how not in control he is, in the RAF. The men are ordered to nail the windows shut for a bad storm, and the incidence of lung infections rises alarmingly. In addition, they have to take up shadow-boxing, to keep themselves alert and on the ready. The men feel demoralized and out of control of their own lives. Herriot remembers a sad outbreak of dog poisonings in this chapter. He feels that he needs to better the lives of the animals in his area, and purposeful injury makes him especially upset. One of the dogs that is poisoned is a seeing-eye dog, which is especially painful for Herriot. He gives it one last chance at life by using a risky drug, and this dog is the only one of the poisoned dogs who survives. 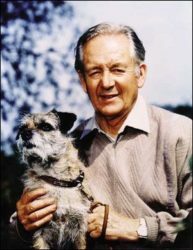 Herriot is glad that if only one dog could be saved it was one who has such an important task in life. Herriot recalls an older women who was very good at not paying bills, back in Darrowby. Rumor had it that she was rich, she just didn’t pay her bills. She wants her cat spayed, and cries until James says he’ll do it for half price. They end up having to transport the difficult cat to and from the old woman’s house, and then she won’t pay until the stitches are taken out. Chapter 18 finds Herriot thinking about how the war has changed life for everyone. He is a Leading Aircraftsman now, a higher rank. The promotion has also brought with it a pay raise. As he is marching away from the Grand Hotel, he promises himself to return after the war, to see it as it should be seen. James recalls in Chapter 19 that the ways of speaking in different areas are much different. His understanding of coarse and sexual language has become more clear since he has been in the RAF. At home, it’s hard to get a farmer to explain what is the problem with an animal, if it is in any way a sexual problem. He finds it rather amusing that particularly the Methodist clients he has won’t say anything about any body part in that area, even if a cow runs into them there. In Chapter 20, Herriot remembers a time before he met Helen, when he was sent along to Hensfield so that he could cover for his former boss, Siegfried. Hensfield is a dreary, dark mill town, and the vet he is covering for generally works on animals for poor owners, for low pay. The veterinary facilities are not what he is accustomed to, and when a Golden Retriever comes in with a severed leg, Herriot has no idea how to treat the dog. In this chapter, Herriot does the best he can, with what he has available, to put the Golden Retriever’s broken body back together. He worries about infection, but does everything he can think of doing, to save the dog. He plasters the dog in a cast, in a way they did in the Spanish Civil War, when they would allow the limb to heal in its own fluids. After a week, the dog is better, and James cleans the leg and applies a new cast. In this chapter, Herriot inspects dogs at a Greyhound track. It is a low quality track, and he finds many problems with the health of the animals. This puts him on the outs with the track owner, but James won’t compromise his standards for the man. At the end of his stay, the Golden Retriever, Kim, comes back for a visit, and Herriot is happy to see how well the dog is doing. James hears a lot of shouting while on duty in the RAF, but none that compares to one farmer back in Darrowby, Len Hampson, who it is said could be heard from farms away when he shouted. James cannot save Len’s pig, but he does save his soft-spoken neighbor’s bull. Later, they all meet up at the local pub, and of course, the soft-spoken man who tells of his bull being healed is sorely drowned out by the big mouthed man whose pig died. Herriot remembers a small animal vet, Granville Bennett, who always drank him under the table, back home. James just cannot seem to get out of socializing with Bennett, and on one visit, he is so drunk that he forgets that he should not eat hot dogs, and he eats entirely too many of them. He pays for that, later on. James thinks about his successful business partnership with Siegfried Farnon, in this chapter. He feels that they work well together because they are opposites, since he is more traditional, while Siegfried likes to try new methods. However, he has noticed that Siegfried doesn’t tell him when some of his newer contraptions don’t work. Siegfried also occasionally chastises Herriot for giving away services to poor clients, even though he does at least as much of that, if not more. James helps farmers bring in their crops in this chapter. He has trouble, and he doesn’t have the skills he needs. The farmer says he just needs to learn how to do it right. Later on in the day, the farmer has trouble delivering a calf, and James helps, and has little problem with the delivery. So he learns that it isn’t a matter of brute strength at all, but of knowing the proper procedure. James heads off to flight school in this chapter. Throughout all the journeys, he sleeps a lot and dreams about Helen. During training, though, all the men are instructed to always have their ID discs with them, since this will be the only way their bodies can be identified if they happen to be shot down. That brings the war more realistically into Herriot’s mind. James is in flight school in this chapter, and his instructor is not very good with trainees. He is rough on Herriot, but no harder than Herriot was on himself, as a veterinarian. He remembers a night when there was an animal who had eaten too much fallen fruit and was in distress. Although he would have preferred to stay at home, he went out in the cold to help the animal, and in the process exposed him to the coughs and chills of the owners. In this chapter we meet one of Siegfried’s pharmaceutical reps, who believes he is seldom wrong. He pitches a new sedative, and they buy some, but they find out that it doesn’t work as a sedative. Herriot and Siegfried try, but they cannot bring themselves to tell the pharmaceutical rep that the product performed so badly. Tristan answer’s the practice phone with a funny accent, until he realizes the caller is a serious man. He would end up dating the man’s daughter. Mr. Mount has a horse with canker, and they stable the horse for six weeks at Skeldale House, to treat him. Tristan continues with his characteristic pranks, but he is caught twice by Mr. Mount, who is not a man of good humor. He is happy with the way his horse was treated and cured, though. This chapter speaks of comradeship, and how necessary it is between men and also between animals. One dog comes in for treatment, and his friend-dog must be in the treatment room with him. You cannot separate the two dogs. When the sick dog dies, the dog’s friend is heartbroken, but when the owners buy a new puppy, the same breed as the dog’s lost friend, he returns to his former happy self. Herriot’s flight instructor talks constantly while he is learning to fly. This reminds him of a family he knows back home, the Birtwhistles. They all try to explain what their animal’s ailment is, with the end result that he can’t hear any of them. One of the sons in the family can’t tolerate the sight of blood, and knocks James out by accidentally hitting him in the head. Herriot remembers a trip to the local market with Siegfried, where they see a dog, begging for food. After a time, the dog is hit by a car and they spend an evening patiently stitching him back together, but if no one adopts him in a week, he will be put down. Luckily, the policeman who called in the accident adopts the dog, and this is a happy thing for the vets. Herriot remembers, in this chapter, a time when tuberculosis was common in their area back in Darrowby, and the veterinarians had to check many herds of cattle. Herriot usually goofs up the forms that they have to send to the Ministry of Agriculture. He recalls that he is a much better veterinarian than a clerical person. In this chapter, Herriot is sent to fly a plane with only nine hours of learning. He fears a crash or at least getting lost, but he does much better than he thought he would. Even though this realization temporarily throws him off a bit, he flies well and finds his way back to the airfield, where congratulations await him, even from his flight instructor. Herriot remembers a farmer whose dairy farm has been automated. One day a cow is having a difficult time calving, and James assists her. He doesn’t know her name, only her number, but it is refreshing for him to see that veterinarians are still needed even with more machines taking the place of other aspects of farming. At the Drovers Arms, he talks to Paul Cotterell who has Theo, the pub terrier. He looks at Theo’s paw and snips the broken claw which has been bothering him. Paul also asks about Theo getting a little thin and they think it might be worms. James gives him some pills but that doesn’t work and James realizes the dog has Hodgkin’s disease. They put the dog down and Paul doesn’t seem that bothered by it but ends up committing suicide. Andrew Vine has a dog, Digger, who has eye problems. He is given lotion, but his vision keeps getting worse. James and Sam see them them on walks while Digger slowly goes blind. Andrew is depressed and James is worried he will end up like Paul and commit suicide. James convinces him that Digger needs him more than ever and eventually, Andrew gets over it and realized James is right. James has David, a 15 year old, coming on rounds with him. They go on three calls which are all false pregnancies and then the last call is a cow who calves and then hides the calf. David thinks James has quite a funny job. In the RAF, James has surgery and the anesthesiologist is from his vet school days. James remembers Judy, Eric Abbot’s sheepdog, who used to watch James fix up the farm’s animals, almost like his own personal nurse. Siegfried is tired of Tristan’s womanizing and partying ways, so he tells him to stay in and study. Then he leaves for Brawton for the night. Tristan has a date with Lydia but has to watch Hamish, a Scottie. He invites Lydia over but when James comes home he hurriedly kicks her out thinking James is Siegfried and in the process he loses Hammish. James and Tristan spent the night looking for the dog which eventually is found on its own front porch, Lydia comes back a few times to yell at Tristan in the process, but by the time Siegfried comes home, Tristan is hard at work studying. James learns he will be discharged. He remembers Mr. Potts, a retired farmer who always likes to talk about animals with James. Sam and Mr. Potts’ dog, Nip used to play and when Mr. Potts dies, James continues to go around to his house so Nip can play with Sam. In the RAF, James gets assigned to laundry and the boot repairs store. The other guy who is also working there doesn’t organize anything, so James doesn’t either. This ends up causing a huge mess when other military people want their clothes or boots back. James sees Roddy Travers, who pushes his dog Jake around in a pram. He does odd jobs around town and when Jake has fainting spells, James thinks it is epilepsy. While James is looking at him in the surgery, he has a fainting episode and James realizes there is something choking him. He operates right then and discovers a pebble that had been causing it. After removing it, Jake is perfectly healthy. Mr. Duggleby is a big cricket fan and talks about it the whole time James is looking at his lame pigs. James thinks it may be Foot and Mouth disease and has to send samples away. Foot and Mouth is confirmed and there are a few anxious weeks while James waits to see if any other farmers get it. He thinks Terence Baileys cow has it but it turns out it just has cowpox which is has gotten from the baby who was just vaccinated for smallpox. Mr. Daggett, a farmer, has a farmhand named Ned Finch that he is always complaining about. They live a hard life on a spartan farm and Mr. Daggett doesn’t like the fact that Ned stays at the pub until ten o’clock and doesn’t get up until seven some days. James then goes to a wonderful rebuilt manor house owned by Miss Treymayne. James discovers that her housekeeper, Elsie, is getting married to Ned. James is happy to hear that Ned will get to leave the hard farm and live in the nice manor house. Marjorie Simpson, brings in a cat with his intestines hanging out. Tristan and James patch him up and up and he starts purring. Helen decides to keep him, names him Oscar and he spends his time going around to social gatherings in town. Then the Gibbons family comes to claim him and confirm it is their cat by saying how much he likes to visit people. They rename him Tiger. Helen is sad, but eventually James and Helen go and visit him. James is finally discharged from the RAF. The bus brings him back home and he is excited about getting back to his life and all the wonderful experiences that come along with it. This is my third reading of all four book in the series. My first reading was approximately 30 years ago, and the second was within about two years of that. One of my students read the first of the Wight/Herriot books and explained it to the class. My wife read all four. She and I were teaching English courses in the same school. Her inability to keep it to herself (which was great!) inspired me. I could now write at length, trying to describe my feelings as I read and my estimation of the various values which these stories impart. For now, however, I have to keep much of that to myself because of time and duty. The enjoyment and the attendant learning — both work together in a wonderful way.